My holiday to the Kruger was amazing. We saw two leopards which is a first for me. 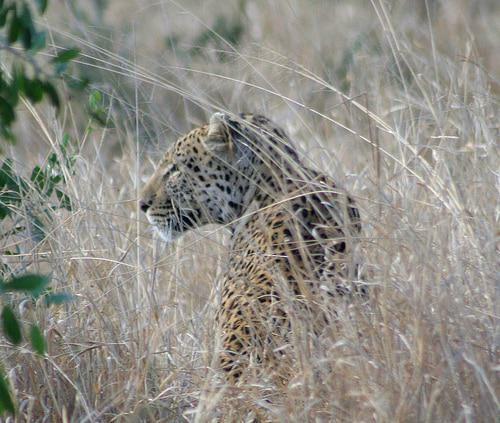 I grew up in Botswana and spent many holidays in the bush but I never saw a leopard….this time we saw two and at close range. This was definitely my highlight. The park had a good summer season with lots of rain so the grass was long, all the animals looked as healthy as they could be and there were many young ones hidding behind their moms. This is the smallest giraffe (just over 1.5m which is the height they are born) and zebra i have ever seen – all fluffly and wobbily. We also saw 8 lion cubs. The funniest moment on our holiday was our experience with the soccer fans that were visiting. Most of them were in small rental cars which made spotting animals in the long grass almost impossible. We had stopped the car to watch baby bushbuck and a baby male nyala which are quite rare to see and a car full of Argentinian fans pulled up beside us. I am not sure if they didn’t see or hadn’t looked but the buck were right in front of them. After we had pointed it out to them they scrambled with excitement for their cameras. About two minutes later a berry fell out of the tree above and all five of them found an open window to hang out off. I think they thought that something in the tree was throwing things at them. Their confused faces as they searched the trees in vain were just too much. Jeremy and I were laughing so hard we had tears in our eyes. Nevertheless, the buck scattered and the Argentinians followed us around for the rest of the afternoon. This entry was posted in Blog and tagged argentinian soccer fans, baby giraffe, baby zebra, funny moment, kruger park, leopard, safari, tourist, Wildlife. I hope the Argentinians were well behaved when they followed you around – they must have known they had very good tour guides infront! I have never seen baby giraffes in the wild… so exciting! i love seeing giraffes, they move beautifully – which i know is an odd thing to say, but i love the way they run. and leopards! oh you lucky lucky girl! We have been to a zoo a few days ago, but that cannot beat seeing the animals in real like you did!! Fantastic photo´s and great story about your trip to the Kruger National park!I wish I could visiting this park too and I hope Anne will do it when she go back to SA one day in future.Have a nice day…Here we have such a heat wave…it is sooooo hot!